The good egg cooked in the scrambled egg recipe is very popular for breakfast. Many like a little milk in their scrambled eggs which makes them softer and moister. I prefer them without thus making the eggs more solid. Besides a simple recipe of scrambled eggs, you can add many ingredients in them for extra taste like the following: onion, chives, pimentos, olives, shrimp, salmon, mushrooms, crisp bacon pieces, ham, sour cream, cilantro, salsa, sprouts, grated cheese, cottage cheese, spinach, tomatoes, oregano, corn, green peppers, hot peppers, blue cheese and fresh dill. Some feel bad asking how to boil eggs because it seems so simple. Actually, there are little tricks to boiling eggs so it never hurts to ask questions. Eggs should be about a week old and at room temperature when boiling. There are two methods of boiling the good egg. One is that you bring a pan of water to boiling before you put the eggs in and the other is that you start the eggs off in cold water. In either case the eggs should lay in a single layer and the timing of the cooking starts when the eggs start in the boiling water. In the cold water method you would start the timing as soon as you see a few bubbles from the boiling water. The following will give you a guideline for how long to cook the eggs for the degree of doneness that you would like. 4 Minutes…The white is only partly set and the yolk is still liquid. 6 Minutes…The white is firmly set and most of the yolk is set with the center soft and dark in color. 8 Minutes…Both the yolk and white are firmly set, although the center of the yolk is still tender. 10 Minutes..Yolk and white are firmly set and the yolk is pale yellow. An overcooked egg is longer the 10 minutes and the white of the egg becomes rubbery and the yolk is dry and crumbly. I always cook more than a layer at a time. I bring the water to a boil first and then add the eggs. I cook them for 14 or 15 minutes and they turn out great. For eggs that must be peeled, ice immediately after draining the water off. This helps the shells to easily be removed. For poaching the good egg, use the freshest eggs that you can. Bring two inches of water to a simmer in a shallow pan. Carefully break the eggs into the hot liquid. Turn the heat off and cover with a lid. The eggs should be done cooking within 3 minutes. When the whites are opaque and the yolk is covered with a thin layer of white, carefully lift the eggs out of the pan onto a plate. The good egg fried perfectly should have a firm white and creamy yolk. Eggs can be fried in various fats like bacon grease. When the fat is sizzling break the egg carefully into the pan. Reduce the heat to low and cook gently basting until the white is set and the yolk is firm. The good egg baked can be prepared in individual dishes or several together baked in small ovenproof dishes. Preheat oven to 400F degrees. Melt ½ teaspoon butter in each dish and break egg in dish. Season with salt and pepper and bake in oven for 4 to 5 minutes or until the eggs are set. There are many other egg recipes; some are a little more complex. Most egg recipes are easy but some take a little more time. There are many recipes like quiche recipes, the soufflé recipe, strata recipe and omelet recipes that serve well for a special breakfast, lunch or for a brunch menu. NOTE: I tried freezing eggs so I would have a “back up” if I ran out. 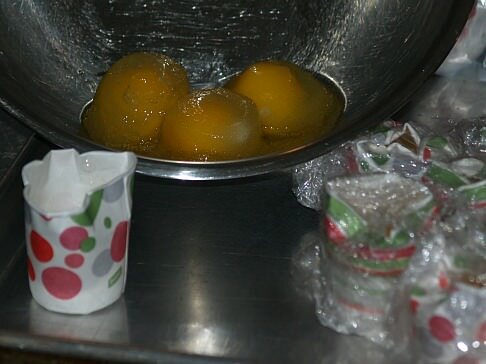 I froze whole eggs in the mini paper cups placed on a tray; then I put them in plastic freezer bags. The ones frozen whole without mixing made the YOLKS tough so I had to blend them in the food processor to take out the lumps. They worked well in cooking things like stuffing. The ones frozen whole which were blended before freezing were much better. I suggest they be done this way. I also froze egg whites separately; when I get the time I will see how those whip up. I will let you know! UPDATE NOTE: After experimenting with freezing eggs I found there is ONLY one way to freeze eggs. The good egg must be opened and beat the whole egg with a mixer. Place egg or eggs (I usually beat 6 at a time and freeze. I use plastic disposable cups, cover with plastic wrap and place on a tray to freeze. After they have frozen I place them in 2 gallon size zip lock freezer bags to store. I have been freezing experimenting with my extra eggs for over a year now. This is the only way they turn out and the eggs are perfect for most recipes calling for whole eggs and also for scrambled eggs. They are a little thicker than when fresh but is easily solved by mixing in a couple tablespoons of water. I measure the eggs out for each recipe allowing ¼ cup for each egg. I also found that it works very well to freeze eggs beaten with milk or cream to use in making quiche. 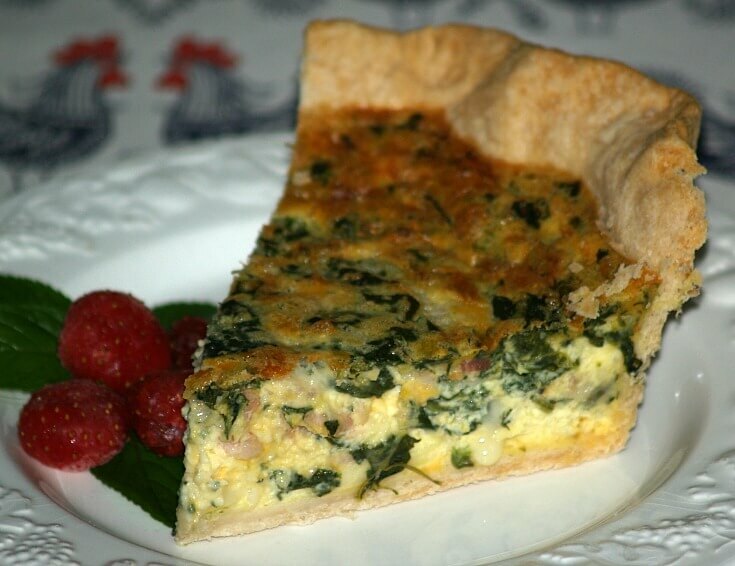 Simply use your favorite quiche recipe mixing the amount of eggs and liquid. After beating well pour into a clean glass canning jar leaving plenty of headspace. Freeze with the lid OFF. After freezing place lid on and return to freezing. To use place in the refrigerator to thaw (About 2 days). Add desired meat, cheese and seasonings; pour into an unbaked pie shell and bake as directed on your recipe. 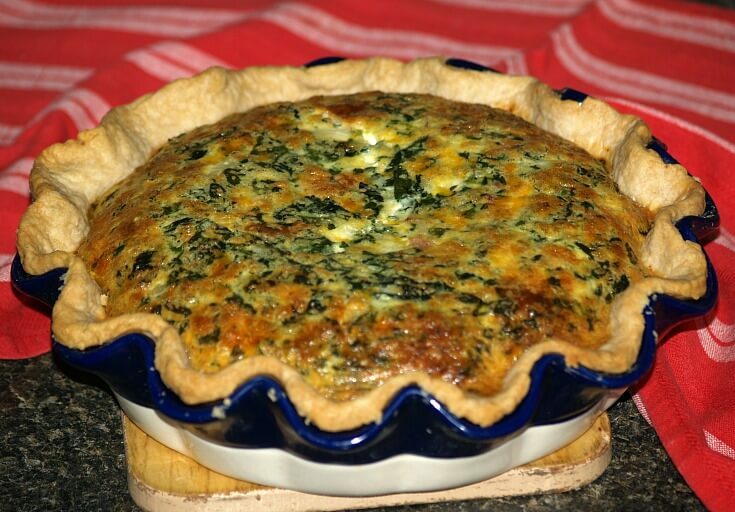 I froze the good eggs with milk and used them in this quiche recipe. Beat together eggs and milk (If you have frozen together, thaw completely). Fold in onion, bacon and all cheeses; pour into pie shell. Bake about 30 minutes or until center is set (Or firm) when touched. Cool 10 minutes before cutting; serves 6. Butter a 9x13 inch casserole dish. Spread bread pieces on the bottom of dish. Layer hash browns over the bread. Spread the meat and cheese over the potatoes. In a separate bowl blend together the eggs, milk, salt and pepper and pour over the layers. Other egg recipes include many delicious desserts like the flan recipe, pound cake recipe, egg custard recipe, or a sponge cake recipe. 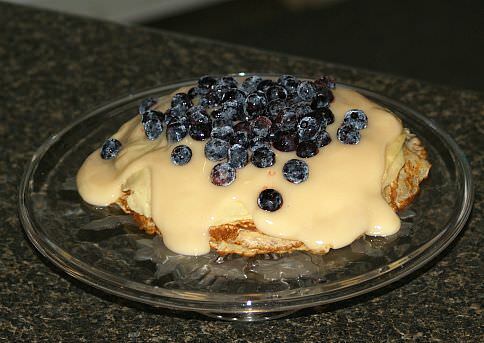 A crepe recipe can be served for breakfast, lunch or adapted to a delicious dessert. My all time favorite use for eggs has been making my homemade egg noodle recipe and then with the whites I always made my angel food cake recipe. They both are delicious. Measure flour, sift it and measure it again; add powdered sugar to the flour and sift together 2 times; set aside. Place egg whites in a large mixing bowl; add the salt and cream of tartar. Beat on medium high speed until foamy. Gradually start adding the granulated sugar by a tablespoon while beating. Beat until stiff peaks form. Gently fold in the flavorings and the sifted flour mixture. Carefully push batter into an ungreased tube pan. Bake for 30 to 35 minutes or until lightly brown. Immediately invert the tube pan on a bottle and let hang until cake is cold before removing from pan. Combine flour and salt in a large bowl; in smaller bowl combine eggs and milk until well blended. Slowly pour egg milk mixture into flour beating constantly until batter is smooth. Slowly add melted butter beating until well blended. Pour batter into pitcher; cover and refrigerate at least 1 hour. Stir batter; if it has thickened thin with a few drops of milk. Melt 1 teaspoon butter in a 7 inch skillet or crepe pan. Pour in 3 tablespoons batter; tilt pan to thinly cover bottom of skillet. Cook over medium heat 1 to 1 ½ minutes or until bubbles start to form on surface. With spatula carefully turn crepe over to cook on other side about 1 minute. Move crepe to platter and continue cooking remaining crepes; add more butter each time. Makes about 34 crepes; store leftovers in refrigerator. NOTES: These are delicious! They are so delicious and easy! Fill with favorite pie filling and top with whipped cream. The good egg is delicious in this scramble recipe. In a large skillet cook hash browns according to package directions. Sprinkle hash browns with garlic salt and pepper; place in greased baking dish. Top hash browns with cheese soup; sprinkle bacon over top RESERVING ½ cup. In another skillet scramble eggs in butter until nearly set; spoon over bacon. Sprinkle top with cheese and reserved bacon; bake 20 to 25 minutes until cheese is melted.